Fire bowls are basically glorified gas fire pits. They have a dual purpose: they act as artistic decor for your outdoor living space, and they are a heat source. Many people find them very easy to use and add to their existing exterior theme. The greatest advantage of this type of fire pit is that it can be placed anywhere; yet, it is lightweight enough to be moved to another location. No messy ashes or soot are emitted from this type of fire pit either. Colored fire glass is added to certain fire bowls to further accentuate the piece and the beauty of the firelight. My favorite fire bowl is the Font O Fire Gas Fire Bowl. This fire bowl complements nearly any setting with its minimalist style and elegance. The Font O Fire can use both natural gas or propane with a simple conversion kit. 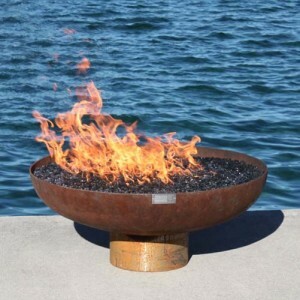 So, if you are looking for a fire pit that has an immense style and will provide you with an ample flame, check out the fire bowl. It will enhance your outdoor experience!